A nationally recognized business strategist focusing on the LGBTQ market, Jenn has been featured in Forbes, The Huffington Post, The Hartford Courant and CNBC among many others. To request an interview call (860) 281-1583 or email. 9.19.2018 – Debt Free Guys LGBT Business at the NGLCC Conference – Debt Free Guys. 7.24.2018 – She Breaks the Mold Podcast Episode #18. She Breaks the Mold. 7.2018 – Beyond The Rainbow Book Review. Professionally Queer. 6.6.2018 – How to Boost Your Business’s Appeal to the LGBTQ Community. NCR Silver. 10.26.2017 – How to Effectively Market to LGBTQ Customers. .lgbt. 8.10.2017 – Beyond Pride sponsorships: marketing to the LGBTQ community. qnotes. 8.9.2017 – Jenn T. Grace: Everyone Has A Story . NGLCCNY. 8.4.2017 – Mom First, Lesbian Second. Unite Virginia. 7.24.2017 – How Businesses Can Take Action To Support The LGBTQ Community. Forbes. 6.22.2017 – Pride-Themed Advertising Is Everywhere, but Hold Your Applause. Vice. 6.21.2017 – Celebrate LGBT Pride 2017 with a new book: “Beyond the Rainbow” by Jenn T. Grace . Total Engagement Consulting by Kimer. 4.11.2017 – New Heights: Azalea Park fights blight by welcoming LGBTQ homeowners. San Diego CityBeat. 4.2017 – 6 Questions for Jenn Grace, Founder & CEO of Purpose Driven Publishing. lgbtSr. 4.2017- Report: A Focus on Marketing to LGBTQ Communities. Stylus Media Group. 1.2017 – Marketers’ Most Wanted. Chief Marketer. 12.19.16 – Speaking to Transgender Customers. The Story Exchange. 11.28.16 – Expert Interview Series. SuperMoney. 11.2.16 – Attention, Advertisers: Lesbians Buy Stuff, Too. BuzzFeed. 8.24.16 – Tips For Marketing To LGBTQ Consumers. Forbes. 6.24.16 – How to reach an LGBT audience white paper. Warc. London, UK. 6.15.16 – Marketing Magnified: What brands can do in response to Orlando. CMO Council. 5.15.16 – Let Us Introduce You. Boston Spirit Magazine. Feature. 4.25.16 – The Virgin Islands Daily News. Why is there no rainbow flag flying at Tourism? 10.31.15 – Health systems use more LGBT imagery in marketing. Modern Healthcare Magazine. Chicago, IL. 8.1.15 – Boston Spirit Magazine. Authentic LGBT Marketing. Boston, MA. 7.1.15 – Boston Spirit Magazine Feature Story. 6.15.15 – Franklin Graham leaves Wells Fargo because of Lesbian Commercial. Tagg Magazine. 4.30. 15 – The Newest of New Mainstream: How to Market to the LGBT Community. Huffington Post. 4.20.2015 – Understanding the Multi-Billion Dollar LGBT Market. Center for Hispanic Marketing Communication. 3.14.15 – Tagg Magazine feature Out at Work. Read it here. 11.22.14 – ‘Professional Lesbian’ Grows Her Marketing Business With Books, Online Content. 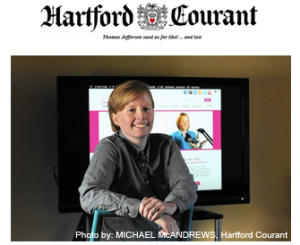 Hartford Courant. Read here. 4.6.15 – TV Appearance. Supplier Diversity explained by Jenn T. Grace, Sam McClure and Rick Callahan on ‘The Hour with Jim Pellegrino.’ COX Connecticut Public Access. New Britain, CT. Watch it here. 5.15.14 – TV Appearance. Interview on Got Girlfriends, New Haven, CT Television. 10.17.13 – TV Interview. The Hour with Jim Pellegrino. COX Connecticut Public Access. New Britain, CT. Watch it here. 9.26.12 – Video. NGLCC Supplier Diversity Road Show Commercial. 4.6.11 – TV Interview about LGBT Business in Connecticut. Transitioning and Loving Life Cable Access TV Program. T.a.L.L. 12.1.15 – Salem State University – Viking Voices: Alumni Success Stories. Podcast interview. 7.4.15 – The Felix Culpa Project by Lisa Corrado. Jenn T. Grace’s Felix Culpa Story. 5.14.15 – Book Signing at the West Hartford Public Library. West Hartford, CT.
6.4.14 – Leveraging the LGBT Market in your Legal Practice with Ann Jenrette-Thomas. 4.30.14 – Jenn T. Grace visits Diversity Rules Magazine On Air with Jim Koury. 9.3.13 – Interview on the Peak Performance Podcast with Mike and Maria Keiser. 6.12.13 – Interview on Equality Radio Live with Randol White. QTalk America. 43:16 into the program. 5.20.13 – Guide for Gay Living Podcast with Jim Duke. 8.4.17 – The Intersection of Personal Brand & Employee Resource Group. National Gay and Lesbian Chamber of Commerce Annual Conference. Las Vegas. 8.4.17 – NGLCC U – Boot Camp for LGBT Certified Business Enterprises. National Gay and Lesbian Chamber of Commerce Annual Conference. Las Vegas. 6.20.17 – SBA’s 2017 LGBT Month Special Observance. U.S. Small Business Administration. 6.7.17 – Women’s Book Event – Changing the Conversation: The Power of Female Voices in Shifting the Business Landscape. National Gay and Lesbian Chamber of Commerce New York. 10.27.16 – LGBT Issues – Education, Etiquette and Advocacy. Town & County Club of Hartford, CT.
10.27.16 – A crash course in LGBT: Why positioning (selling) your products or services to the LGBT Community is good for your bottom line. Association of Personal Photo Organizers. 10.20.2016 – How writing builds brands and drives business. Entrepreneurial Women’s Club. 8.26.16 – Marketing Diverse Certification and Other Sustainable Practices for Success. National Gay & Lesbian Chamber of Commerce Annual Conference. Palm Springs, CA.  8.23.16 – NGLCC U – Boot Camp for LGBT Certified Business Enterprises. National Gay & Lesbian Chamber of Commerce Annual Conference. Palm Springs, CA. 7.12.16 – Working with the LGBT Community – what you need to know to be successful! Planned Parenthood. 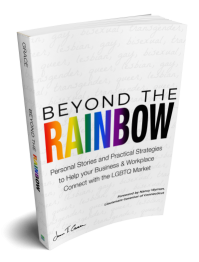 6.16.16 – Personal Branding, Storytelling and Community Building for LGBT Employees. Fortune 100 Company. Chicago, IL. 4.27.16 – The 5 Action Steps You Must Take to Sell to the LGBT Community. Travel Gay Canada Tourism Conference. Winnipeg, Manitoba, Canada. 4.16.16 – Marketing your book to the LGBT Community. Connecticut Publishers and Authors Association. Avon, CT.
4.13.16 – Personal Branding for the LGBT Entrepreneur. Executive Networking Night. Boston Spirit Magazine, Boston, MA. 3.16.16 – Understanding the LGBT Market. Bloomberg LP. New York, NY. 3.13.16 – Make your LGBT Wedding Business Soar. The LGBT Expo. New York, NY. 2.17.16 – Personal story. PFLAG Hartford. Hartford, CT.
2.17.16 – LGBT Biz Builders with the SBA & NGLCC. Boston, MA. 12.8.15 – Making Markets Matter: Strategies and Insights into Powerful Markets and Customer Segments. CMO Council. Napa Valley, CA. 9.24.15 – LGBT 101: Top tips for Effective Communications for Realtors Selling to the LGBT Community. Southbury, CT.
8.12.15 – Big Time Marketing on a Lean Budget. National Gay & Lesbian Chamber of Commerce International Business & Leadership Conference. Fort Lauderdale, FL. 8.11.15 – Marketing Industry Cluster. National Gay & Lesbian Chamber of Commerce International Business & Leadership Conference. Fort Lauderdale, FL. 7.28.15 – Beyond LGBT 101: Understanding, Navigating and Communicating in a Healthy Way. Safe Haven of Greater Waterbury. Southbury, CT.
6.12.15 – Intro to the LGBT Market. Women’s Mastermind Group. Westport, CT.
5.21.15 – Book Signing at Cafe Louise for Fete Accompli. West Hartford, CT.
4.28.15 – Keynote Speech at Salem State University for the Annual Portfolio Night for Communications Graduates. Salem, MA. 4.20.15 – LGBT Week NYC. Start-Up & Entrepreneur Conference. New York City, NY. 4.17.15 – Guest Speaker at Salem State University Annual LGBT Pride Dinner. Salem, MA. 3.18.15 – LGBT Executive Briefing. New Mainstream Business Summit. Miami, FL. 2.7.15 – Guest Speaker for the Yale University LGBTQ Affinity Group, New Haven. 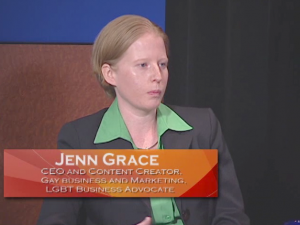 CT.
11.12.14 – Building LGBT Consumer Loyalty Through Effective Communications. Send Out Cards Webinar. 10.10.14 – How to be a Face for Change as an Ally. Mid-America Gay & Lesbian Chamber of Commerce. Business Equality Conference. Kansas City, MO. 7.29.14 – Chamber Leader Staff Academy. National Gay & Lesbian Chamber of Commerce Annual Conference. Las Vegas, Nevada. 3.21.14 – True Colors Conference. How to Effectively Communicate with the LGBT Community. Storrs, CT.
3.18.14 – Authentic Gay Marketing for the Canadian Tourism Industry Part 2: Why are you Trying to Reach the LGBT Traveller? 3.14.14 – Marketing to the LGBT Community with Stonewall Columbus, Inc.
2.25.14 – Authentic Gay Marketing for the Canadian Tourism Industry Part 1: Who is the LGBT Community? 12.4.13 – How Bed & Breakfast Owners can Increase their LGBT Market Share. Private webinar. 10.28.13 – Out & Equal Workplace Summit. Beyond Affinity: Unleashing the Power of Employee Resource Groups. Minneapolis, MN. 9.22.13 – National Gay & Lesbian Chamber of Commerce Supplier Diversity Road Show in conjunction with Out & Equal Workplace Advocates. Springfield, MA. 7.31.13 – Chamber Communications: What’s your message? 2013 National Gay & Lesbian Chamber of Commerce annual conference. 5.7.13 – National Gay & Lesbian Chamber of Commerce Supplier Diversity Road Show. Boston, MA. 10.20.12 – The State of LGBTQ Rights in the U.S. The 2012 Reaching Out LGBT MBA Conference. 10.4.12 – Authenticity: The art of marketing to the LGBT community. Annual World Conference of InterPride. 8.8.12 – Better Together: Teaming Workshop. 2012 Out for Business Conference. National Gay & Lesbian Chamber of Commerce. 5.3.12 – The New Partner in your Life: Corporate Partnerships. The 2012 NGLCC Northeast Regional Summit. National Gay & Lesbian Chamber of Commerce. 4.28.12 – Employer Equality. Transgender Lives: The Intersection of Health and Law Conference. Connecticut TransAdvocacy Coalition. 12.13.11 – Profit by investing in a diverse workforce. The Workplace Inc.
7.3.11 – Blazing the Trail: Opening State and Local Procurement Opportunities. 2011 Out for Business Conference. National Gay & Lesbian Chamber of Commerce. 6.30.11 – LGBT Small Business Panel at The Hartford. Hartford, CT.
6.24.11 – Diversity Panel at United Technologies Corp. Hartford, CT.
5.6.11 – Creating long lasting partnerships with Corporations. The 2011 NGLCC Northeast Regional Summit. National Gay & Lesbian Chamber of Commerce. 4.30.11 – Employer views, trends and issues regarding the trans community. Transgender Lives: The Intersection of Health and Law Conference. Connecticut TransAdvocacy Coalition. 4.28.11 – Internet Marketing Seminar with eVisionSEM. 2.24.11 – LGBT Procurement Opportunities. Aetna Supplier Diversity event. Women’s Business Enterprise National Council. 1.13.11 – Internet Marketing Seminar with eVisionSEM. 6.29.10 – Women Leaders Teleconference. National Gay & Lesbian Chamber of Commerce. Looking to book Jenn as a speaker? You can do so here.